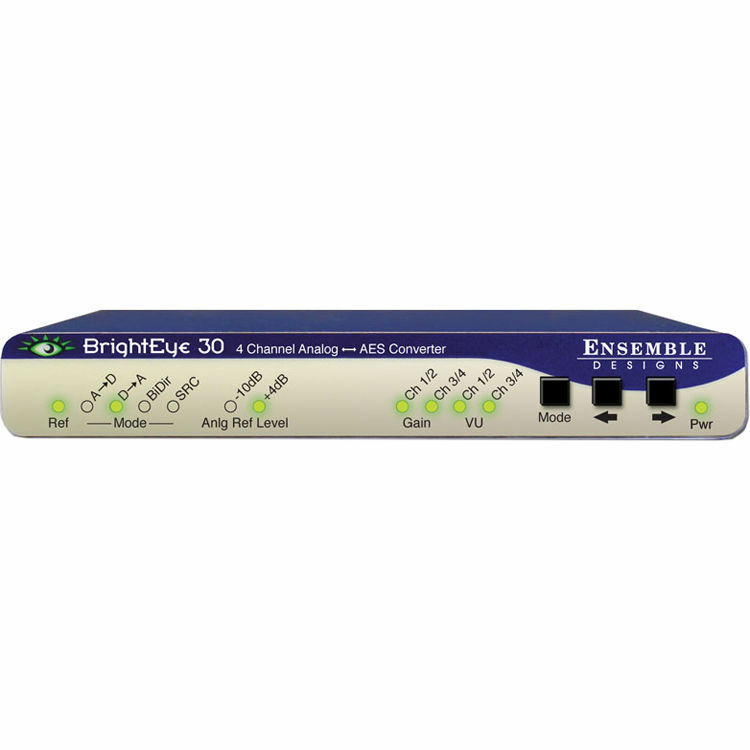 The BrightEye 30 Audio ADC and DAC Converter from Ensemble Designs is a device that can be configured as a two or four-channel converter for ADC and DAC. As a bi-directional unit it converts two channels of analog audio to AES digital with a parallel stream converted into (2) channels of analog audio. As a four-channel unit, AES can be converted to analog audio and vice versa. It is an ideal solution for desktop, post-production and broadcast applications. The converter's 24-bit processing ensures high quality audio. Its reference input allows digital outputs to be synchronized to a PAL or NTSC video signal or AES reference. A variety of separate audio connectors and adapters are also available for this unit, allowing integration with a wide array of audio systems. An optional audio delay can also be obtained for this unit upon request. Front-panel controls allow you to adjust many parameters. Moreover, audio mixing, level adjustments, and channel shuffling can be controlled through the BrightEye software package that is included with the unit and compatible with both Windows and Mac platforms. Use this device as a two or four-channel converter for ADC and DAC. The unit's 24-bit processing ensures high quality audio. Box Dimensions (LxWxH) 8.8 x 7.9 x 2.5"